Our 3D-Microscope SMP-24 enables you additionally to a normal microscope top illumination and transmitted light microscopy. So you are able to get additionally to the conventional 2D-microscopy the plastic observation of three-dimensional objects. This precision equipment with high-performance optics is conceived for professional applications. The metal execution is qualitatively high-quality, compactly and very stably (2500g). The working distance of 80mm is unique in its class and the 360° tiltable head enables a comfortable investigation of even large objects. An impressing depth sharpness combined with the large visual field supplies a outstanding spatial overall view of the view article. The replaceable 10-fold far field of eyepieces is 45° bent (binocular diagonal view) and enables you an ergonomic and relaxed working. The left eyepiece has additionally a ±5 dioptrin strong visual acuity adjustment. The equipment achieves a 20x, 40x and 80x magnification in the delivered version. The maximum (optional) magnification is 120x (6 x 20). The new lighting consists of one separate adjustable 10W halogen top illumination and a 10W strong incandescent light component leaving no desires open. The equipment is directly connectable to the normal 220V power supply without any annoying power pack. 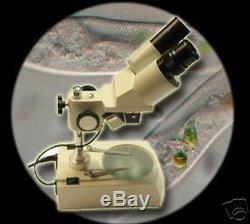 The microscope comes with two additional contrast slides/plates black and white for optimal contrast. Typical areas of application are control and treatment of electronics construction units, Plates, material analysis, jewels as well as all other applications of microscopy.